It’s Friday which means a lovely recipe post from each of my Foodie friends in the #FridayRecipeClub. As usual this week we had a prompt which we were to use to create a recipe. This week’s prompt was salad. Since I’ve been eating cleaner and following a Paleo diet, I’ve been making loads of salads but I felt like coming up with something more dessert-like because I’ve been craving sweets. My mind drifted to some of the lovely fruit salads we’ve been having and I knew which one I’d choose immediately. Almost exactly 1 year ago I bought my very first dragon fruit and experimented. Fact is that I chose it because it looked so beautiful that I had to know what it tasted like. After many trials I came up with a Dragon Fruit Smoothie recipe which is super delicious, if I do say so myself.. Since then we’ve enjoyed Dragon Fruit many times and today I’m sharing a simple recipe with you all which our family enjoys. This salad makes a delicious dessert which is jammed with good-for-you stuff which you can read all about in my post from a year ago. Dragon fruit is so aesthetically pleasing that we really should use the skin as a cup for our salad don’t you think? Begin by cutting the dragon fruit in half and loosen the meat from the skin by running a spoon around the edges. You can continue doing this and actually scoop the meat out all in one or use a melon baller to scoop out the meat in pretty balls. If you removed the dragon fruit meat out in one piece, either ball it now or cut into squares. If you are using the skin as a cup for your dragon fruit salad, cut off the long green shoots so that the top is trimmed and easy to hold. Also take a moment to trim the greens off of the bottom of the skin so that the fruit sits upright and doesn’t tip over as you fill it. Place the melon, dragon fruit balls, pineapple, raspberries, mint and pineapple juice into a bowl and toss until all of the fruit is well coated. You can omit the juice if you’d like and simply serve without the dressing, but dragon fruit tends to be a bit bland and the other fruits and juices lend to it this way. 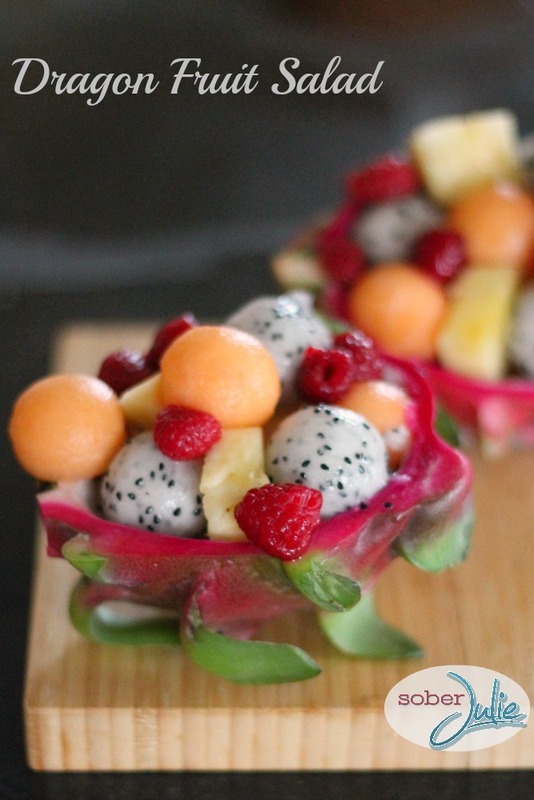 Now simply layer the fruit into the dragon fruit skin and garnish with mint if you’d like. Place in the fridge for 20 minutes to chill and enjoy! 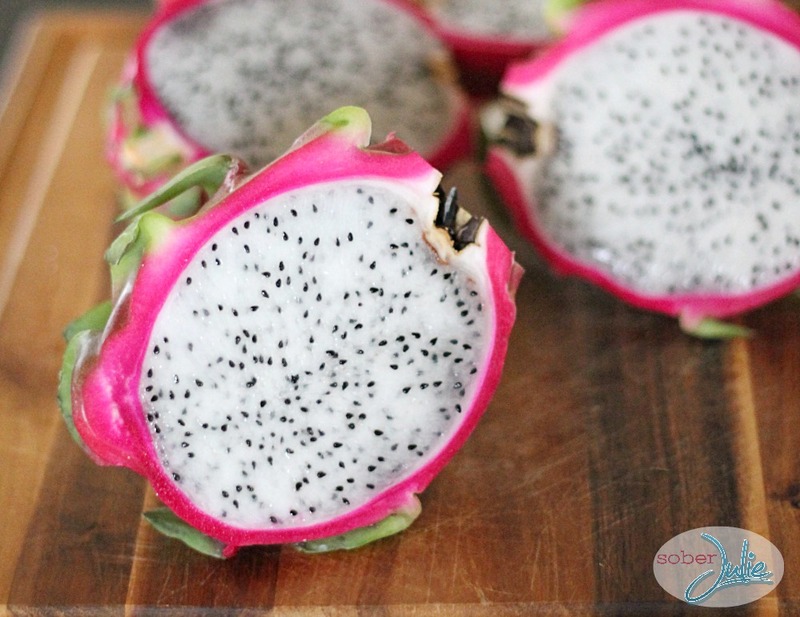 Cut dragon fruit in half and loosen the meat from the skin by running a spoon around the edges. Scoop the meat out all in one or use a melon baller to scoop out the meat in pretty balls. If you are using the skin as a cup for your dragon fruit salad, trim off the long green shoots so that the fruit sits upright. 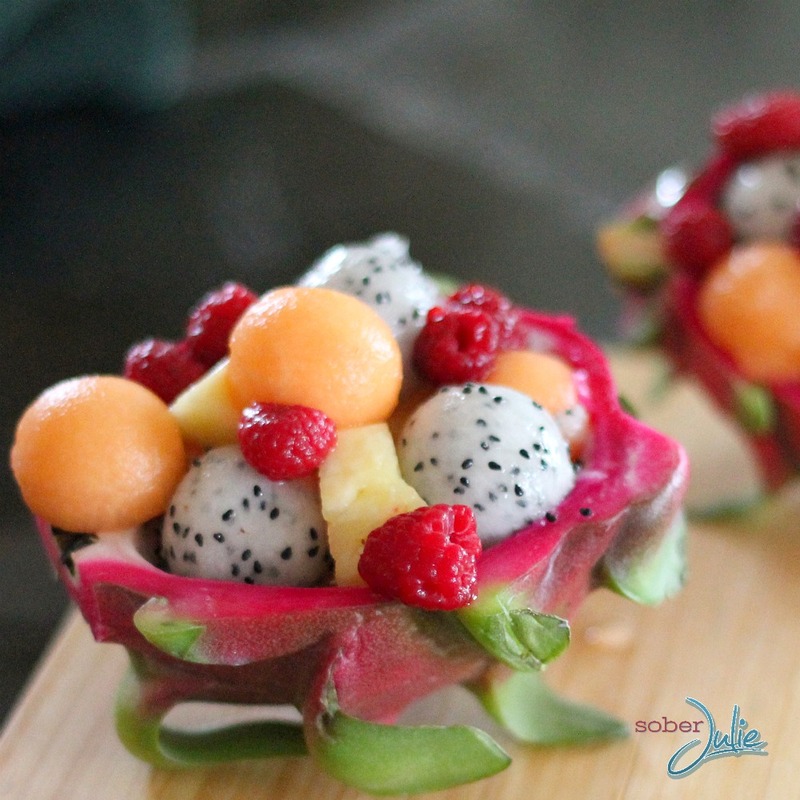 Place the melon, dragon fruit balls, pineapple, raspberries, mint and pineapple juice into a bowl and toss until all of the fruit is well coated. 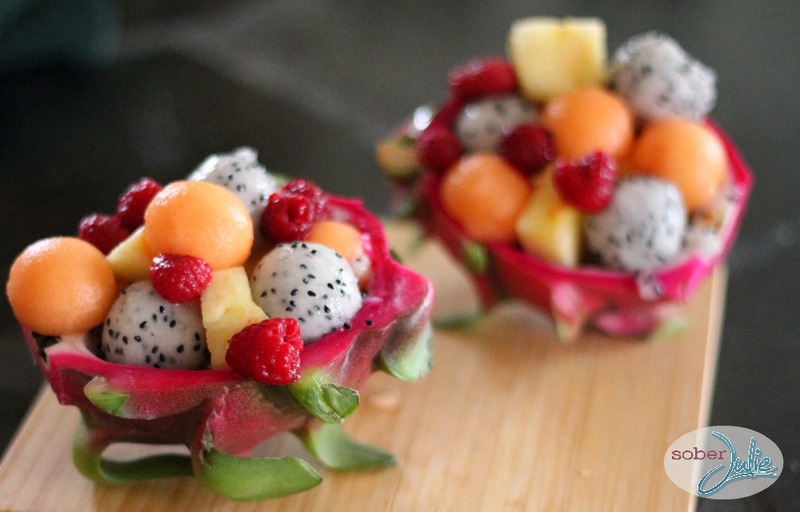 Layer the fruit into the dragon fruit skin and garnish with mint if you'd like. Place in the fridge for 20 minutes to chill and enjoy. To see my fellow #FridayRecipeClub salad recipes just click any link below. That is the most beautiful salad ever!!! Looks amazing Julie. Your creations always impress me!!! I need to find dragonfruit!!! This looks so good but my store doesn’t carry it ugh. I absolutely LOVE the look of this little fruit cup and the idea of using the peel of a fruit as the dish. It’s visually stunning as well….as always! What a beautiful salad! I don’t think I’ve actually ever tried dragon fruit, but it’s so pretty that I really need to! 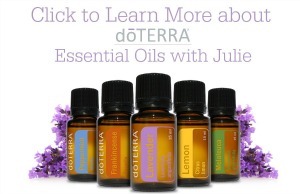 Great recipe Julie! Yum! 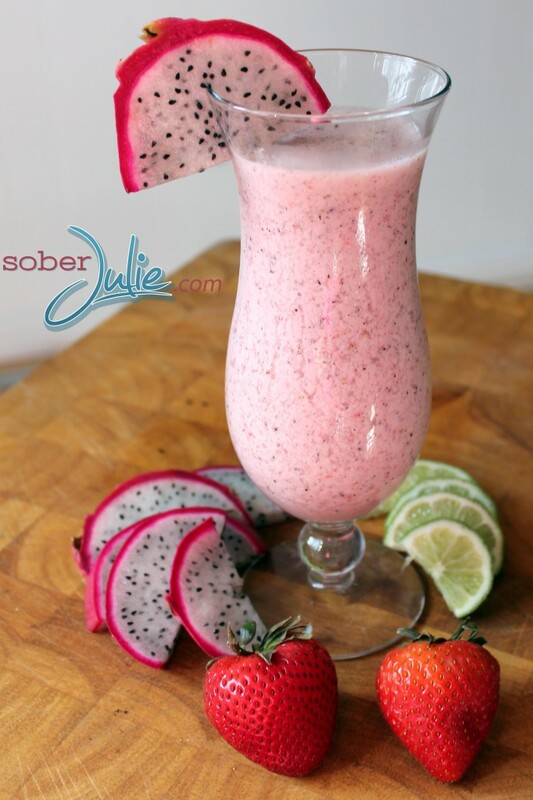 I seriously LOVE checking out your blog Julie, everything looks so delicious :) I’ve yet to try a dragon fruit but they seriously look tasty and have me thinking about grabbing one the next time we go to town. Mmmm I have always wanted to try Dragon Fruit! Now I have a recipe to try! Thanks! I love the look of dragon fruit. So pretty. Don’t think I’ve ever tried it before though. What a dazzling looking salad to have for dinner guests! wow does that ever look beautiful! i wouldnt want to eat it , it looks so pretty lol. but seriously such a perfect summer dish. looks refreshing ! I love the presentation! It looks too pretty to eat! I love dragonfruit but do not eat it enough! I have never thought about making a fruit salad with it so I am definitely going to try this out the next time I buy dragonfruit. What a wonderful idea! My family loves eating dragon fruit, so I’m sure this salad will be a hit! I can’t believe I haven’t come across this recipe until now, love it, my kind of salad, it looks gorgeous!